KTAL/Channel 6/Shreveport has announced its new anchor team for the station's weekday evening newscasts,5, 6, 10. The husband/wife team of Dan and Jacque Jovic will be anchoring all three weekday evening newscasts. The Jovics joined KTAL in October 2012, Dan has been the morning co-anchor and Jacque has been the evening co-anchor. It's not known who will be the new co-anchor of the morning program. Nick LaFave left the station in August. KARK/Channel 4/Little Rock has announced changes to its morning program. Beginning Monday, September 29th KARK Today will begin at 4am...and have new faces. A press release says the 4am to 5am hour will be hosted by Aaron Nolan and meteorologist Natalie Walters. "We've seen a trend of people waking up earlier and either turning on the television or jumping on social media," said KARK 4 News Director Austin Kellerman. "This additional hour will be targeted specifically to them." Mallory Brooks and meteorologist Greg Dee will join the pair for the 5am to 7am hours. KARK Today will be the earliest starting morning program in the Little Rock market as all the others begin at 4:30am. 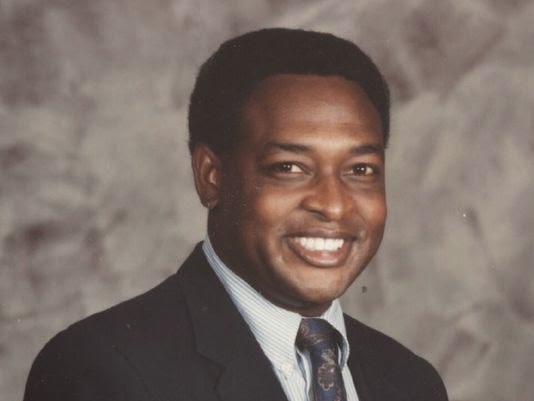 Former KTHV/Channel 11/Little Rock Sportscaster Max Morgan has passed away. Morgan was on the air at Channel 11 during the 1980's. According to KTHV, Morgan left Little Rock in 1989 for Baltimore..then on to KDFW in Dallas for 20 years. Morgan was in the hospital being treated for congestive heard failure and passed away Monday. KTHV has a tribute posted on its website. Better late than never huh? The numbers from the July Nielson Ratings book are in. Arkansas Business.com has all the numbers and analysis for your viewing pleasure. The numbers show KATV swept all but one of the news broadcasts for the month of July. Well KATV/Channel 7/Little Rock seems to have found its new weekend sports anchor. Kyle Deckelbaum from WKBT/Channel 8/La Crosse, WI is joing the Channel 7 crew. Kyle is a Washington DC native.Kyle posted his departure from WKBT on its sports face book page. KATV/Channel 7/Little Rock weekend sports anchor Robert Burton signed off Sunday night.Burton is moving to Washington DC 's WJLA. Burton had been at channel 7 since 2011. KTAL TV Texarkana newsroom evacuated today after suspicious substance/device found inside. I wasn't even aware had a live living newsroom in Texarkana anymore. I know they have their call letters and logo on the outside of a building on Summerhill Road. I thought when they pulled out of Central Mall that was it for a studio/newsroom in Texarkana. 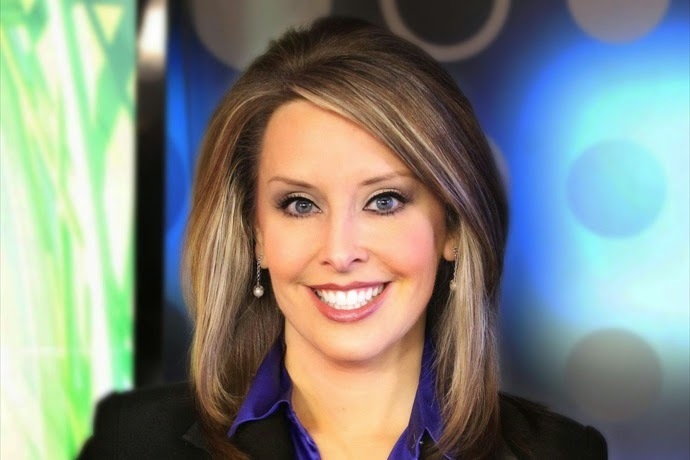 KNWA has announced long time anchor Neile Jones is leaving the station. I wonder why Raycom doesn't tell its viewers the full story as they seem to want to continue to dawg Direct TV. I would think they would be thanking Direct TV and paying them as without Direct TV the station's wouldn't have many viewers as it has. Take a gander at what WMBF..yes a Raycom station posted about Direct TV. Raycom Media is a company built on local news. As journalists we pride ourselves on sticking to The Facts as opposed to the conjecture and opinion DIRECTV is sending to customers and Washington. DirecTV earned $2.3 BILLION dollars in 2013, and their profits were up 14%, yet they profess to be "fighting to hold costs down for their subscribers." DIRECTV has removed stations from its lineup at least 12 times in the last 3 years as a negotiating and political tactic, including another broadcaster, just last week. Since our last agreement with DIRECTV, Raycom Media has successfully negotiated more than 200 agreements without disruption to our viewers. That's a 99% success rate. In the history of our company only 3 providers have removed our stations from their system-DIRECTV being one of them. Raycom Media looks forward to working with DIRECTV to turn our agreement in principle into a final, fully-binding document. We fully support the terms both parties agreed to Sunday and hope DIRECTV will too. Local TV isn't worth paying for. They preach you will miss your news, weather and sports...really!?!? The internet is available 24/7 with all that information. Maybe stations can take those pennies they get from the sat and cable companies and get some reporters/anchors worth watching. Direct TV and the others should hold out longer..long enough to hurt the station's ratings. Then see whose pocket book it really works. You lose viewers by being greedy you will soon suffer. KATV/Channel 7/Little Rock promotion manager Rob Thomas is leaving Arkansas. A post on Well Dunn Talent's blog confirms his move. The blog says he will be heading to Louisville, KY and working at Raycom NBC affiliate WAVE-TV. Thomas had been with Channel 7 for 6 years. Now we wonder how much Direct TV subscriber's bills will go up. We thank all of our affected customers for their patience over these past several days and regret that Raycom and too many other broadcast stations are willing to resort to these contrived blackouts to antagonize the public rather than serve it,” said Dan York, chief content officer at DIRECTV. Raycom Media has worked all day to get a deal done and offered to continue into the night. DirecTV admitted it only needs under 2 hours to get Raycom back on the air so why are they walking away from the discussions now? Call them and ask… We have an offer on the table and will be here all night if needed to hear back from DirecTV. Over the years we value that you have come to rely on KSLA News 12. We value your loyalty, and we regret that our service has been interrupted for some of our viewers. There is a lot of noise and half-truths in the media about the situation with DirecTV. Please bear with us while we give you more background on what's really happening. As a local broadcaster, we have a longstanding special relationship with the Ark La Tex that we have been serving for 60 years. We have teams of people dedicated to providing local news, weather, sports and entertainment 24 hours a day, 7 days a week, 365 days a year. You know a lot of those people. While DirecTV, located in Los Angeles, may not think too much about dropping KSLA from their service, it's a big deal to us- we live here. Our economics are simple. We invest heavily in the content that makes KSLA great. That includes local programming, like hours and hours of local news and weather and top tier national programming from our network, which costs us much more today than it did three years ago. We offer all of this programming at no cost to you in its entirety, 24/7/365 over the air and on our digital platforms. In addition to offering our programming over the air, online and on mobile devices, we also provide it to pay TV providers for a small fee per month. This dispute is about what that fee is for DirecTV. We offer some of the best sports and entertainment programming on TV, like NFL and College Football, NCIS, The Big Bang Theory and 6 hours/day of top quality news and weather coverage from the Ark La Tex. All of that comes at a cost, and those costs increase over time. In fact the cost of our network programming has more than doubled every year on average for the last three years. We are asking DirecTV to cover their fair share of those increases, like any business would, since our last deal with them is 3 years old. But you deserve to know that what we are asking for is a fraction of what DIRECT TV pays some cable networks that are not nearly as popular in the Ark La Tex. In an average hour, 20% of the Ark La Tex viewing audience watches KSLA. DirecTV pays other content providers that have a much smaller audience 4x more than what we are asking for. Said another way, DirecTV pays certain cable networks four times what we are asking for, while those same cable networks have a fraction of our audience! 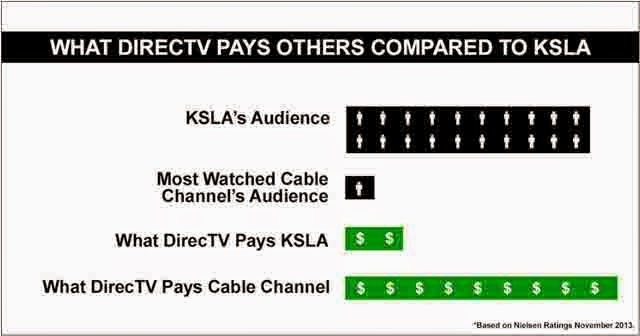 DirecTV doesn't understand why KSLA is so important to the ArkLaTex. Why else wouldn't they be willing to pay a fair price?